I’ve been making playwriting/screenwriting a bigger part of my practice in recent years. 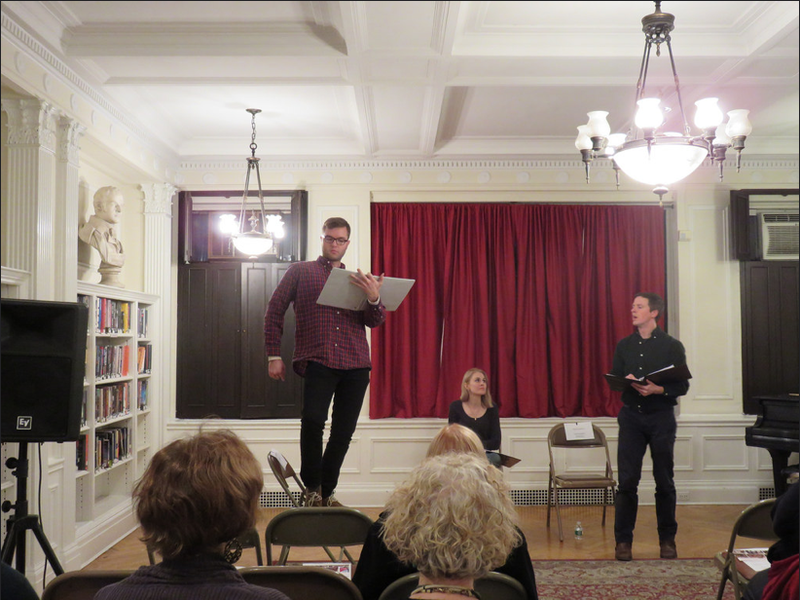 Most recently, Christopher Stephens, Natalie Bird, Jason Faust and I collaborated on a performance/reading based on Bright Shards of Someplace Else. This project, Shards: A Live Book Trailer, was put on in Fall 2014 at the Center for Fiction in NYC. You can watch part of the performance and see some photos of the event here. A scene from “Line of Questioning,” i.e. the street performer giving a speech. Another big project that has gone through many transformations is a romantic comedy screenplay, Snow Angel. 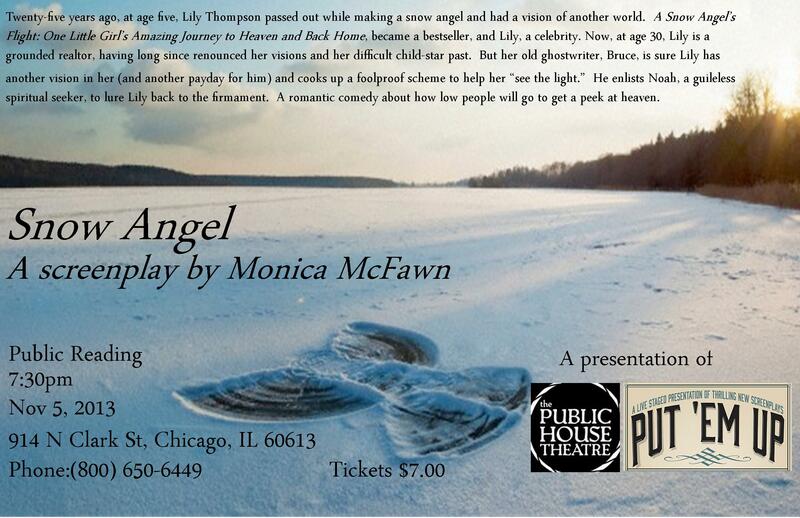 Snow Angel began as a improv/writing experiment in July 2013, which had a small public reading at the Duane Park Supper Club in NYC on July 7, 2013. The script of Snow Angel was collaboratively created within one week–Christopher Stephens, the director David Conrad Brouillard and six actors all helped to create a full storyline using a combination of improv/wrtiting/directing. While certain actors read specific parts for the final reading, all actors played and improv’d all the parts during the week, sometimes switching out mid-scene. Later, I decided that Snow Angel would work better as a film. I rewrote the script entirely, and an early version of the screenplay had a public reading at the Public House Theatre in Chicago, IL as part of their “Put ‘Em Up” salon of new screenplays. A flyer from that event appears below. Since then, the screenplay has been further revised and is being submitted to contests. Most recently, it was named a quarter-finalist in the Nashville Film Festivals’s Screenwriting Contest.